MiGadgets has launched a digital video recorder DVR CAR PRO X10. This digital video recorder, with its audio and FULL HD (1920×1080) recording, makes the driving experience intelligent, safe and intuitive. The stylish and sleek DVR CARPRO X10 has a compact design and supports an external memory of 32GB with a continuous recording loop function while on the road. 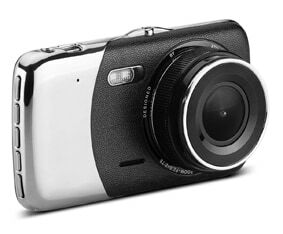 Other interesting features include a G sensor with motion detection in case of recording in the case of impact, photo capture, 170-degree ultra-wide view, and ability to record in poor visibility. The rear VGA camera support in DVR CARPRO X10 is worthy to mention about as it prevents rear car accidents. Another outstanding feature of CARPRO X10 is PIP support (picture in picture). PIP supports 3 options all front camera, or both front and back camera simultaneous recording. It uses H.264 compression, a compression technology of next level and that provids higher efficiency in recording. The DVR CAR PROX10 is built around a ARM Cortex A7 core processor and comes a 4.0-inch FULL HD color IPS LCD along with features like automatic recording, loop recording, video mode with SOS, built in microphone and speaker. MiGadgets unveils CARPRO X10 in India 0 out of 5 based on 0 ratings. 0 user reviews. Perfect gadget for all the travellers! Waah, kya Raapchik maal hai boss. Looks like a good product! I’m very eager to try it out.